There looks to be a lot of fighting going on in the wands, which seems unusual since this is the spiritual suit. But then I guess there is an awful lot of fighting going on in the spiritual world, today as ever, and too much of it seems to be fighting over territory. Many folks with particular ways of seeing the world want the whole world to be with them, as though it would help them feel secure. I don’t mean this post to be about actual geographical territory, however, but about a more personal kind of internal territory where we are mapping out our own spiritual ground and it takes some wrestling to discover where we stand. 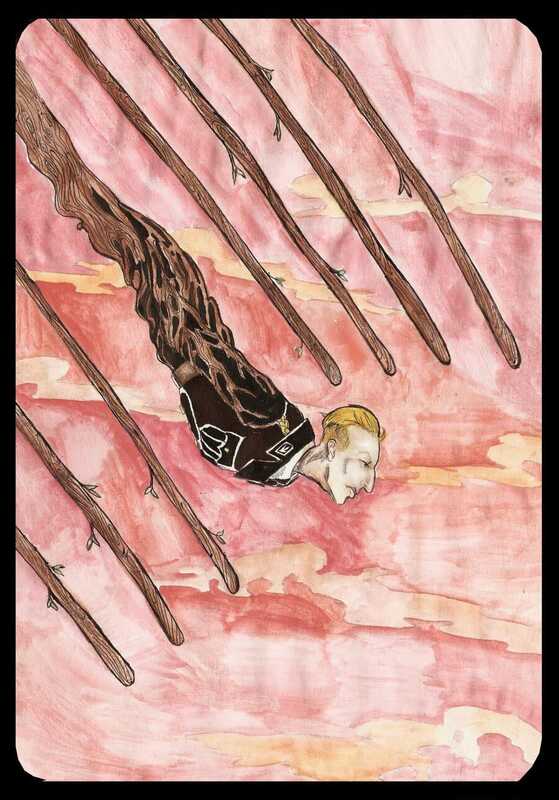 The tarot card five of wands shows young boys play fighting with their sticks in the mud, waving them in the air harmlessly, barely making contact, most of them held in only one hand. This is like the games of childhood, where we learn to set our differences against each other, without coming to real dispute. When we are young we are likely to accept without much question the outline of the spiritual world as it was given to us, though as we begin to notice that others around us have conflicting spiritualities we have to test our understanding against others’. This cognitive dissonance must be resolved in some way, and as we reach adulthood we choose our own form of spirituality, either to follow that of our upbringing, or to map out new territory to suit our individuality, or to set the issue aside and avoid spirituality altogether. The tarot card six of wands shows a victory. This person has chosen a particular spiritual path, and with those of like heart parades in celebration. The member who has joined this tribe is lauded for making such a wonderful choice, raised up on a horse and given the laurel wreath to wear on the brow. This is exhilaration. As the crowd raises their wands at the victory of having brought another sheep into the fold, a strong bonding takes place which helps to cement the new person into the flock. One can be proud to be a member of a strong group, living and learning together. Perhaps this is the end of the story for many people. They have found their spiritual home, and they live in the world with this bubble of support. But not everyone is destined to land here, firstly, happily and permanently. 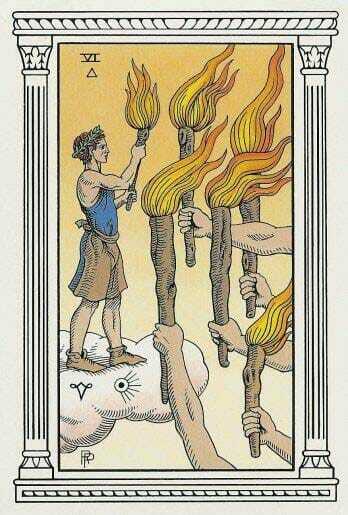 The tarot card seven of wands suddenly shows us the person in battle against the same crowd of raised wands which a moment ago surrounded him in celebration and support. What could’ve happened? The member has become an individual again, come down from off the victory horse, and is standing on his own two feet, though at this delicate stage of separation he is at the edge of the cliff fighting for a foothold. How often it happens that the sheep is brought comfortably into the fold, only to find he is not a sheep at all, that he needs to think a little differently than the flock. This can cause another cognitive dissonance not only internal to the individual, but disturbing to the group and resulting in a disruptive separation as the individual struggles to find his own way of thinking and believing. 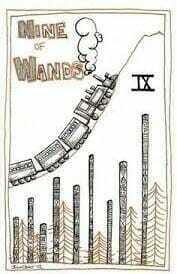 Here I’m going to fly past the tarot card eight of wands, showing the eight wands rushing through the air. This is almost always pictured as one of the few cards with no people in it, but for the illustration I couldn’t resist the image of the man coming out of his wand chrysalis. This card is said to symbolize passion, activation, speed, flight, progress, time for action, growth, and it is where the individual goes through the difficult process of finding his own spirituality. In the tarot card nine of wands we find our Hero (or Fool, since our character wears both hats on this journey) a little battered but still standing. He holds his wand firmly, and it helps to support him. The wisdom he has acquired with such difficulty is arrayed behind him, showing us that his spirituality is multifaceted. In this tarot card our Fool (or Hero) finally lands with his feet on solid rock. We had seen in the seven of wands that while he perched on the sod, the rock of the cliff rose up from below to hold him above the crowd. Now the pasture is behind him, and he has a wide swath of concrete territory to call his own. We do well to remember that the tarot works in cycles large and small. These tarot cards five through nine represent a small piece of the larger journey, and can repeat themselves throughout our lives. I myself was raised as a Presbyterian (their flag is a little scary, with a person burning perhaps in hell) but I had a fairly typical adolescent rebellion involving candles, incense, Siddhartha, and the Electric Kool-Aid Acid Test. In college I morphed into something more studious, I won’t bother you with the reading list, and then Karen Ay gave me a deck of tarot cards and I wandered into esoterica. Finding the tarot was by no means the end of my spiritual recycling, indeed my feelings about the tarot have changed more than once over the last thirty-seven years, and naturally the tarot is not my spiritual center, by any means. I found for myself an important and necessary lifelong practice, to continue searching for people who have ideas that are new to me, to find whether they resonate with me or not, to find whether these ideas, if incorporated into my own spirituality, would enrich my life. These enrichments add another wand to the line of achievement we see in tarot card nine of wands. But keep in mind, the journey is different for everyone and some reach the end only to find themselves back where they started. It’s the journey itself that lets us test our spirituality against the universe of possibilities and find for ourselves what is right and where we must stand. The opening cards are from The Waite Smith Tarot deck. 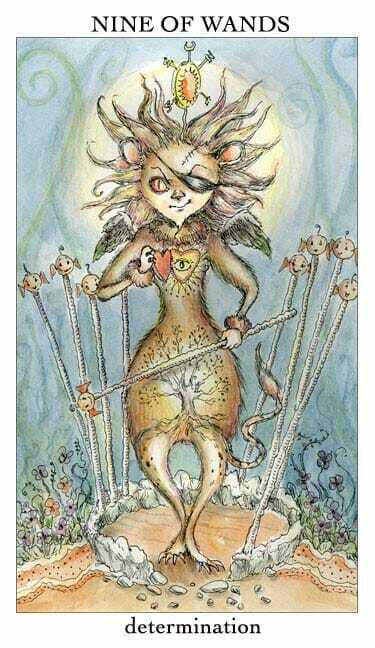 The Five of Wands card is from The Tarot of the Magical Forest. 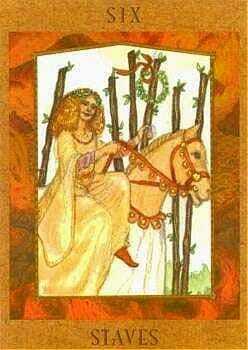 The first Six of Wands card is from The Goddess Tarot deck. The second Six of Wands card is from The Alchemical Tarot deck. 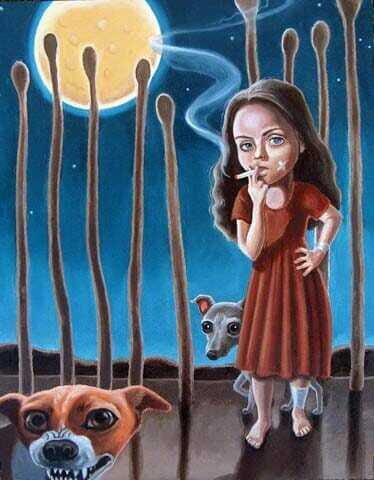 The first Seven of Wands card is by Brenda Flatmo. 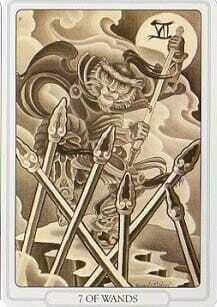 The second Seven of Wands card is unknown. Information is welcome. 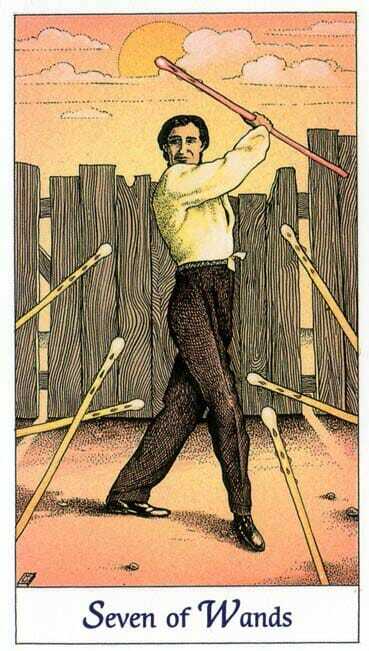 The first Nine of Wands card is from the Joie de Vivre Tarot deck. The second Nine of Wands painting is by Gwen Rosewater. 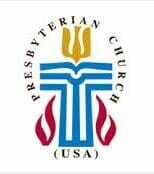 The Presbyterian graphic is from the Presbyterian flag. 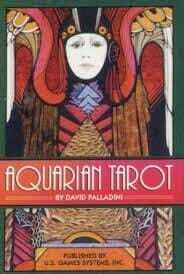 The Aquarian Tarot box image is more modern than my first tarot deck, circa 1976. 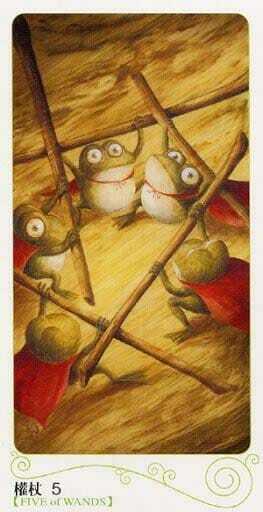 The third Nine of Wands card is from the Lisa Chow Oracle Tarot deck.